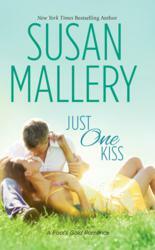 Just One Kiss by Susan Mallery, a romance novel released just in time for World MS Day – May 29 – features a mom who has multiple sclerosis. Mallery wanted to honor people with the disease by creating a character whose MS is something she lives with, not something that defines her as a person. She’s more than MS - she's a businesswoman, a computer programmer, a mother, a grandmother, a friend. She’s smart, she’s loving. And she has a secret life that she’s been hiding from her daughter for months. May 29, 2013 is World MS Day, and this week, bestselling romance author Susan Mallery has released Just One Kiss, a book that features a character with multiple sclerosis. In keeping with how people with MS live their lives, Mallery’s character focuses on what she can do rather than what she can’t. Mallery wanted to honor people with the neurological disorder by creating a character whose MS is something she lives with, not something that defines her as a person. Mallery talks about her characters as if they’re real people. To her, they are – and to many readers, too. Mallery is known for her keen insight into human nature, and her ability to create compelling, flawed, yet likeable characters. World MS Day is a global awareness raising campaign established in 2009 by the Multiple Sclerosis International Federation (MSIF) and its member MS societies. Learn more about it at http://www.worldmsday.org. Just One Kiss, a Fool’s Gold romance, is available wherever books and e-books are sold, and a free excerpt is available at SusanMallery.com.